The Franklin STRADA MODEL STR-12 110R is a compact radio signal receiver and converter. The unit receives WWVB atomic time and updates system time every minute. Provides minute impulse for driving tower clocks or synchronization of master clocks. The National Institute of Standards and Technologybroadcasts radio signals accurate to less than one second every million and a half years. The STRADA MODEL 110R captures these signals and utilizing internal CMOS micro-processor technology, decodes the time signal into pulses. Franklin’s MP Series and WDP-M+S master clocks are designed to receive STRADA pulse to maintain and display precise Atomic Time. Control Pulse: Bi-Polar minutes impulse. Power Input: 110 VDC, 60 Hz. Super-heterodyne receiver, CMOS microprocessor, Antenna fully weatherproof. 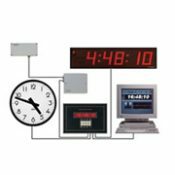 Traceable accuracy from NIST Master clock. Operating Temperature -30 through +70 degrees centigrade. LED pilot lamp for signal verification. Call us at 215-355-7942 to order this item.